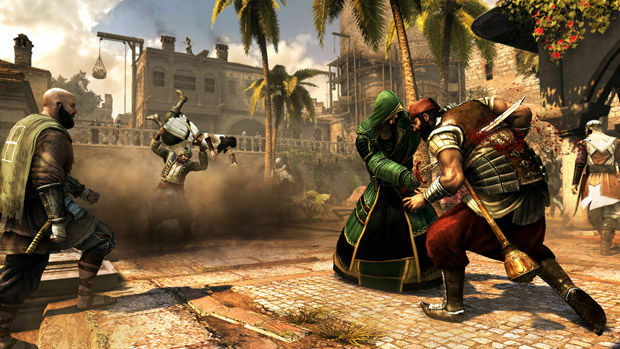 GameStop is listing the first DLC worth a damn for Assassin's Creed: Revelations -- The Mediterranean Traveler Map Pack. Listed with a January 24th, 2012 release, this pack is rumored to offer a handful of maps for the popular multiplayer mode: Siena, Jerusalem, Dyers, San Donato, Firenze and the Imperial District of Constantinople. Some of these maps were in Assassin's Creed: Brotherhood as well, so this might please a few of you 'old school' stunaholics out there. No mention of whether or not it comes with a patch that allows you to actually jump into a game with a group of 2-3 players without waiting for half an hour, but the GameStop page does list a $9.99 pricetag while the Assassin's Creed Wiki is claiming it will be 320 Microsoft Points or $3.99. I don't believe Ubisoft will charge us the same amount for six maps as they do for four character skins, so that $9.99 price seems more likely. We'll know more when they decide to officially announce it.